More than five years have passed since we started our tour towards the South Pacific. Tarita has either been under way,or dug down in some hiding place being protected from the cycloneseason. Life onboard ,down there ,is so different compared to "normal" ratrace life back home in Sweden. Not that everything is allways better being down there,,just very different. Most cruisers agree that while Blue Water cruising, you experience some of your most fantastic moments in life,as well as some dreadful moments when you ask yourself "what am I doing here? " But life onboard is very near the real essence of life being focused on reality , concrete problems, and with a very different timeperspective where today is your mainfocus. Back home we run in a system where money (like never in history),is the measurement of allmost everything. In my own world of medicine medical doctors who used to be individuals practising "The art of medicine", are more and more becoming "Bricks in the Wall". Being here with all memories creates a strong desire to be back down there, reminding me of the film Apocalypse. "After my first tour it was worse.When I was here I wanted to be there,and when I was there,all I could think of was getting back into the djungle"(Martin Sheen in Apocalypse Now). 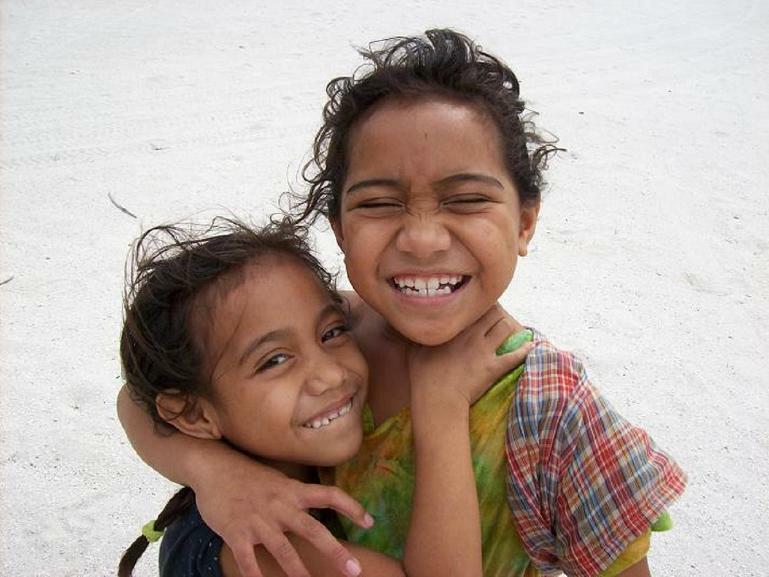 The two happy girls from the atoll of Palmerston may represent the happy Polynesian islanders who are not yet "Another Brick in the Wall"